We are pleased to announce the release of the final stable version Plumi 4.0 based on the latest Plone 4.0. Plumi is a package of Plone products and customisations that enables you to create your own video-sharing community, out of the box. Plumi is an open-source free software project maintained by EngageMedia since 2005, and used to run the EngageMedia.org website. This new final version of Plumi 4.0 includes bug fixes and improvements to ensure a stable release primarily focused on rebasing Plumi on Plone 4. Other improvements include updating the caching system to create a faster site, clean-up of installation and architecture to ensure forwards-compatibility, updating of third-party software modules, and inclusion of codecs required by the transcoding framework to make installation easier. Developers now also have the option to install a lighter development site for testing purposes, or a fully-featured production website. You can read more about Plumi 4.0 on the Plumi blog or on the Plone website. This release has been produced by Unweb (https://unweb.me) in conjunction with EngageMedia (https://www.engagemedia.org). The Global Social Change Film Festival and Institute announced the semi-finalists, and at least two of them are our friends. Good news folks, the film we endorsed, Charlie Hill-Smith's Strange Birds in Paradise made it to the semi-final stage of the Festival's jury process. Another film, The Burning Season, also made the list which include films from Sierra Leone, the Middle East, Turkey, Bali, Japan, Korea, Australia, the UK, and New Orleans. You can watch The Burning Season's trailer on EngageMedia here. We recently upgraded EngageMedia.org to the new Plumi 4.0. This upgrade provides a number of improvements to the site such as faster page loading, an improved text editor and an easier way to publish content to spaces such as twitter and facebook. We're currently finalising the upgrade so you may still find the occasional issue with the site. Please let us know if you do. We'll provide a full update on all the changes when the release is fully complete. In Yogyakarta, on the rainy morning of December 11, I joined a group from Komunitas Dukementer—the main organizers of FFD/Jogjakarta Documentary Festival—and decided to begin EngageMedia screenings. When we started, there were only a handful of people scattered around the room, which was a shame considering that the schedule for the screening had been circulated for months. Before the screening began, I gave an introduction to EngageMedia.org, our mission, and our recent activities. The screening itself took about two hours, from 11a.m. until 1p.m. 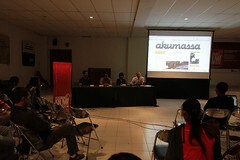 After that, I joined a panel discussion about social media and online video distribution, alongside two representatives from other organizations: Mira Febri Mellya from Akumassa; and Harwan Aconk Panuju from E-code films/Toni Blank Show. We discussed the enormous impact social media has had on online video distribution. By the time the panel started, many more people had arrived at the venue, and we enjoyed the active participation of more than fifty people, who joined in with questions and opinions. At the end of the discussion, we again faced the feelings raised by the film Social Media—social media is an ongoing process, and the video community has an important role in its development. EngageMedia contributed promotional materials to the exhibition, including free stickers and postcards, and screened the climate film compilation Time for Real Action (T4RA). 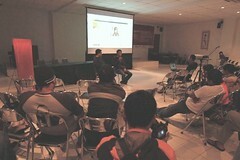 We met again at Camp Sambel in June, and one of the hot topics of discussion was licensing of activist video. We decided we need to get some of the dilemmas down in writing. What is unique about the Indonesia situation? Why is Creative Commons not used to its full potential? How can it be localised? What kind of colonial roots are there in the current licensing solutions? So we submitted an idea for a journal article to Platform… and got it accepted. Oh, dear, now we had to really write, not just ramble. We met to do some outlining in Yogya, sitting up the back of a conference like naughty kids, and then had some nasi pecel to assign tasks, and from there, we worked remotely. Ferdi I and I usually nongkrong on Skype as he is in Jateng and I am in NSW. Academic publishing takes a long time, so it feels as though things have already changed since we wrote this piece, but we are happy that our thoughts finally got 'out there'. We really think it contributes to an important discussion. let us know what you think. …research is nothing if it is not interactive. Oh and of course, the writing is licensed with CC. Folks, as mentioned before, we will be participating at the Global Social Change Festival in Ubud, Bali this coming April. Here's a blog post by our dear friend Prof Zimmermann about the Festival and its founder, Cynthia Phillips. Enjoy! What do agricultural economics and cinema have in common? And five more... the Global Social Change Film Festival (GSCFF) slated to unspool in Ubud, Bali, Indonesia April 13-17, 2011. For Cynthia Phillips, the founding director of this new festival, the challenges of food security, world hunger, poverty, and sustainable futures lead directly and logically to film and media for social change. The Global Social Change Film Festival and Institute focuses not on film markets, deals, auteurs, landing big movie stars, discoveries of the next breakthrough genius, or launching the next new wave. To this end, the festival plans to convene filmmakers, activists, and audiences for meaningful discussion in Bali, an island renowned for its embrace of the arts, slower pace, and open culture. With only 8 feature films screened in open air venues over 4 days, the festival is making a strong statement that extended dialogue matters. Phillips hopes that filmmakers will explore how to build audiences beyond festivals by linking with activist groups. And she hopes that activists will learn more about the possibilities of a range of media. It’s a large mandate—but scalable. For Phillips, one word keeps everything in focus: outreach. Phillips sports an unusual background for a film festival director. After getting her PhD in agricultural economics from Michigan State University, she pulled together a team to record a convening by the USAID on hunger and poverty in Africa. That lead to a stint in Singapore working in international marketing for American Express. And, now, she’s a high profile, high energy strategic planning consultant for a range of high end clients like One Degree Media, 2020 Fund, and others via her C. A. Phillips Company. Along the way, she did some programming for the Sedona International Film Festival in Arizona around sustainability issues and locally sourced food. That experience ignited her interest in solving a key unresolved problem lurking underneath the utopian, user-generated, all-tools-are-accessible-everyone-can-do everything, Web 2.0 media ecosystem: how do we build audiences for beautiful, well-produced social change films? The Global Social Change Film Festival seems to be unpacking that gnarly audience and outreach question in innovative ways. It’s honoring the nongovernmental social media group EngageMedia in Jakarta, Indonesia with a special innovator award. It’s giving a special activist award to the Women and Children Crisis Center of Tonga. And it is honoring Indonesian filmmaker and social activist Nia Dinata. During the day, the Institute part of the festival will offer a range of pointed workshops on pressing, unresolved, but necessary topics like Commercially Viable Social Change Filmmaking and Distribution, Hybrid Models of Distribution, and Film, Audience Building and Social Action and Environmental Film. However, challenges lurk despite this clarity of vision, marketing savvy, and ability to pull in partners like the Global Fund for Women, Global Girl Media,and First People’s Worldwide. All films need to pass through the government review board for approval, a time consuming process but one that GSCFF respects as part of the media regulatory environment in Indonesia. It’s also hard to pull together resources in a tough economy for a first-time film festival. Some of your devices, favourite software and even your webcam are helping people you can't see get to know you and what you do in ways that are just plain creepy! The Electronic Frontier Foundation (EFF) thinks so too. In a recent newsletter (EFFector Vol. 24, No. 1 January 3, 2011), the EFF wrote about Traitorware. This is “technology that acts behind your back to betray your privacy...” Apple are big on Traitorware and it’s wanting to patent their flavour of spyware. Sony have been the invisible monkey on our backs since 2005. Private use aside, if you working on any social change issue and you’re not acting to protect your data you leave yourself, your sources and your cause vulnerable. If governments can influence private enterprise (Amazon, PayPal, Bank of America to name a few) to shut down services to Wikileaks imagine what they can do to you. You can start by learning how our personal and professional data can be used. Find out more on Dont Track Us and why using Google search may not be such a cool thing. Scroll to the bottom of that page for a list of essential tools you can use. Security In A Box is an excellent toolkit designed for activists by the Tactical Technology Collective. This is an essential source for both how-to’s, software and critical information. The most important thing we can do is to be informed and not be slack. Don’t get paranoid, get smart.